Problem: I now have to transfer all my applications and data across. It will take me a while to do that. Solution: I’m going to dedicate an hour a day to getting my new PC up and running. And I thought it will help me organize my new PC right from the start and I’ll only transfer exactly what I need. This thought got me thinking some more. I am surrounded by clutter. My current PC is full of clutter – old files, documents and products. My book-shelf is full of clutter…books I’ve read and will never read again. Books I’ve purchased on a whim and will never read. I have old CD’s, tapes, DVDs’, a cupboard full of wires, damaged computer bits, headphones that don’t work…just stuff lying around filling my life with CLUTTER! And guess what clutter does? Not only does it distract me, it is always at the back of my mind, that I need to do something about it. By buying my new PC, it has made me think more about clearing out the clutter. During the month of May, Johnny has been getting rid of clutter in his life by giving away, throwing away, selling, cancelling…10 things each day. I thought it was such a great idea and I’m going to do the same for each day in the rest of July…starting today. 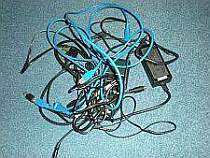 I have a big box of cables and I went through them and got rid of quite a few. Now…they’ve GONE and I feel so much better. Wonder what I can get rid of tomorrow? P.S. I’m actually looking forward to it! I’m glad it is going to help. What are you going to get ris of? Oh my! I have exactly the same problem, clutter all over the house, my whole life is full of clutter. In my kitchen drawers, on the shelves, in my computer, on my desk, on my i-pod, phone, in my children’s rooms 😀 I have huge problems with cables and wires that keep getting tangled up all the time as soon as I touch one of them. I agree with you cleaning up and throwing some old stuff away make you feel GOOD! Tackle one room, one draw…at a time. Be ruthless and throw away stuff you have not used in the past 6 months. Hey, Andrew! I hear you with the clutter, I hate it, too. I have found recently a cool tool to help me focus on writing and avoid distractions. It makes whole screen black and you only see what you type (and the word count if you want to). It is called Write Room (I’m on Mac), but there are several of them out there. Some are free and some are in the $30 range. I can avoid distractions much better now, as otherwise I jump all the time on Facebook, mail, forums and so on…. My distractions are not really from what is happening on my computer…it’s what is all around me! Sounds like a good tool, though. You are right, the less there is clutter, the less there is distraction. There is so much clutter around us nowadays. In this modern world the clutter is also more and more in digital form. I think that it is a great idea that you decided to get rid of stuff that you don’t need anymore. Me and my wife do this every year (at least once a year): We go through our closets and other places and get rid of stuff we don’t need. After I finish replying to comments here I will be tackling another go at decluttering. It will be my fourth day and I am looking forward to it! I know how you feel my friend, my office and bedroom are one in the same. The clutter is very depressing, and really does lower productivity. So, you going to do something about it, Dennis? Soon. The clutter on my computer itself comes first. It is worth doing…all that clutter is distracting!